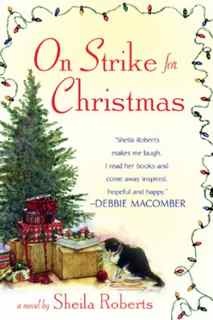 Joining us today is Sheila Roberts, whose novel ON STRIKE FOR CHRISTMAS is the story of the women of Holly who brace themselves each year for stress, overwork, and very little understanding or appreciation from the men in their lives. (Hell-o, those little cranberries don’t just string themselves…) But then inspiration hits and the ladies decide to “go on strike” and give the men an opportunity to see firsthand what it takes to make the holidays merry and bright. Let’s give Sheila a big Deb welcome! The holidays are almost upon us, and I can’t help but feel all warm and fuzzy as I remember so many perfect celebrations, like the Christmas Eve when our car transmission decided to stay forever in second gear and we got to take the scenic route home from my brother’s house – twenty-five miles at twenty miles an hour. With two little kids. Of course, we took all the back roads and highways, and if I’d been in a better mood, I’d have survived the trip with a lot more grace and humor. As it was, all I could think of was the gazillion things I still had to DO before Christmas morning, five a.m. And, wouldn’t you know it? I had not stocked the car for emergencies. There wasn’t so much as a crumb of chocolate anywhere. My husband kept trying to lighten the mood and keep the kids entertained. “Hey, look guys. A tire store.” Woohoo! All that good cheer of his just made me grumpier. Lucky for him I didn’t have a lump of coal handy. I’d have stuffed it in his mouth. We got home at two in the morning. It was the only Christmas my children slept in. And then there was Sheila’s overdone holiday. I am not, by the way, referring to the turkey. I’m talking about me. I had completely overdone it. Gone over the top. Baked enough to ensure I gained at least twenty pounds, made Christmas candy for every teacher my kids had or would ever have, and made presents for the entire planet. I had taken on the work of sixty elves and I was totally behind with everything. In fact I was so behind that I was still making presents as we drove into the city on Christmas Eve afternoon, frantically stitching the finishing touches on a gift for my godparents. My husband hit a bump in the road and I stabbed myself in the finger with the needle. I won’t tell you what I said, but you can probably guess that it wasn’t, “God bless us, everyone.” Now, that’s the Christmas Spirit. That was when I had my epiphany. Holidays should be holidays. They should be fun for everyone. Mom included. Don’t you think? And that applies to any celebration, whether it’s Christmas or the Fourth of July. We women need a break now and then, too. Which is why I have never understood the lure of camping. Mom seems to always be working while everyone else is playing. As far as I can see, a camper is just another house to clean. I say viva the Holiday Inn. I say roughing it should be when the motel pool isn’t heated. I say that a lot. Sadly, when a girl’s pup tent budget doesn’t match her heated motel pool tastes, she ends up spending a lot of vacations toasting marshmallows in the back yard. But I stick to my guns. We women deserve a break. I still rarely make it to that Holiday Inn, but I do give myself a break, especially this time of year. I don’t go on strike like the characters in my book. I simply take some well-deserved time off. I mean, why not? It is the holidays. So, the week before Christmas, the Mommy Mania work machine shuts down and it’s just me, my hot chocolate, my friends, and my favorite chick flicks. (I never get tired of watching Nicholas Cage learn his lesson in The Family Man!) Other than stocking stuffing on Christmas Eve and re-heating that pre-cooked Christmas turkey, I am a free woman. Now, that’s a merry Christmas, and I encourage all you other overworked Santa’s helpers out there to try it. Slip some extra chocolate in your stocking and put your feet up. And God bless us, everyone. Sheila Roberts lives in the Pacific Northwestwith her husband and three children. She’s been writing since 1989, but she did lots of things before settling in to her writing career, including owning a singing telegram company and playing in a band. When she’s not speaking to women’s groups or at conferences she can be found writing about those things near and dear to women’s hearts: family, friends, and chocolate. What a great article, Sheila. And smart advice too. For me, the numerous trees, the family cookie bake, and Christmas parties are never really a task, but it is okay to take a break every once in a while and enjoy the spirit and joy of the season without feeling like I am slacking. Loved the book. Look for my review soon. Best of luck with the rest of your tour. Oh, we Martyr Moms are FABULOUS at holiday time, aren’t we? I do like that idea of tearing up the “have-to” list and just plunking down in front of a movie marathon. Although I know I just don’t have it in me to not do as much as possible. That martyr thing is just so ingrained! I am camping-averse as well. If there’s no room service, it’s not a vacation! Sheila, fun post, thanks for joining us today!! Sheila, I can’t believe you’d ever go over the top for Christmas HA HA HA HA or shall I say HO HO HO HO. ~~!! Over here we know Sheila as the Christmas Queen but I have to say, I have noticed you’ve simplified, which is probably the word we’re all looking for in regards to the holidaZE. I told my kids we were getting everyone cows and chickens this year from the heifer project http://www.heifer.org instead of the usual Best Buy plunder –picture two teenagers with ipod wires coming out of their heads staring at me with those confused wide eyes–it took a while before they understood,and believe it or not they started thinking up other gifts that didn’t “feed the machinery” or create more land fill, like movie tickets, show tickets, etc. Okay its a theory and we’ll give it a try. I’ve been completely banned from stuffed animals, and cut off from American Girl dolls, so I turn to being socially responsible. LOL augh we’re so American! The good part is my son is a chef so we can look forward to a truly fabulous dinner. Okay everything I say sounds grossly consumer driven so I’m going to quit. Is it me or are the holidays starting earlier every year? I fully expect next year to celebrate Labor Day by buying Christmas cards. Yeesh. Target had Xmas stuff out before Halloween in my neighborhood! It’s still 80 in Florida — I just don’t see myself getting in the mood unless it snows. The Heifer Project – what a great idea! Suz, I applaud you. That’s brilliant. There are so many worthy causes we can support this time of year. Samaritan’s Purse is one of my favorites. But there’s also The Humane Society, The Salvation Army, The Red Cross – so many worthy ways to make the holidays meaningful. LOL, you girls are a riot! I wanted to thank all of you for hosting Sheila today…it was quite a treat! Love this blog! Speaking of the holidays, I do notice it starting earlier and I’m one of those who is a part of it! I loooove Christmas! This year, Hannukkah starts the WEEK after Thanksgiving. Gah. I know some kids who are getting leftover turkey sandwiches for presents. Lisa–I don’t think you’ll EVER get in the mood for Christmas–if it snows where you are, that means the world has come to an end, doesn’t it? I hear ya about the premature Christmasization, it’s insane. I saw Christmas stuff out at a number of stores in late September. I think it was a desperate ploy because all predictions are shopping will be off a lot this year. Also, we have neighbors with Halloween, Thanksgiving, AND Christmas decorations up. All at the same time. Thanks for the great post, Sheila! I will take your advice to heart and start planning my strike–I mean, day off, now. And if you read my post for tomorrow you’ll see how much I enjoy camping! !